The 'Good Life' has never been so popular. More and more of us are searching for the perfect rural idyll - our very own piece of the countryside where we can live side by side with nature, produce our own food, and have a degree of control over what we eat. Written by an experienced and successful smallholder, `The Smallholding Manual` is ideal for existing landowners as well as those contemplating a move to the countryside. Unlike previous books in this genre, it takes the reader right from that all-important Step 1 - finding the perfect smallholding to creating a viable lifestyle. It offers a complete introduction to the myriad potential land uses and provides clear, step-by-step guides to getting to grips with enjoying a new, more fulfilling lifestyle. The ‘Good Life’ has never been so popular. More and more of us are searching for the perfect rural idyll – our very own piece of the countryside where we can live side by side with nature, produce our own food, and have a degree of control over what we eat. 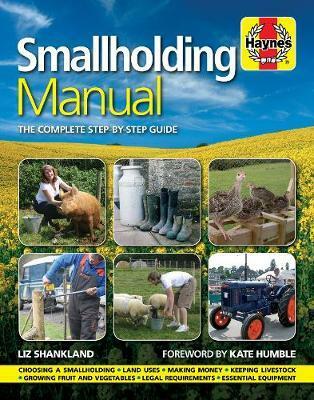 Written by an experienced and successful smallholder, the Smallholding Manual is ideal for existing landowners as well as those contemplating a move to the countryside. Unlike previous books in this genre, it takes the reader right from that all-important Step 1 – finding the perfect smallholding to creating a viable lifestyle. It offers a complete introduction to the myriad potential land uses and provides clear, step-by-step guides to getting to grips with enjoying a new, more fulfilling lifestyle. • Taking on a smallholding: pros and cons, commitment needed, financing the move. • Finding the perfect place: importance of location, land needed, common pitfalls. • Getting ready: learning new skills, planning how you will manage your land. • Legal requirements: getting registered, dealing with red tape, livestock regulations. • Essential equipment: finding the best kit to make light work of chores, health and safety. • Growing fruit and veg: improving soil, extending the growing season, planting an orchard. • Your first livestock: buying, caring for and rearing animals for meat. • Growing feed for livestock: care of grassland, making silage and haylage. • Selling your produce: regulations involved, direct sales, farmers’ markets. • Wildlife-friendly farming: biodiversity, habitat maintenance and creation. • Showing your livestock: getting started, preparation, using shows to promote your stock. Taking on a smallholding: pros and cons, commitment needed, financing the move. Finding the perfect place: importance of location, land needed, common pitfalls. Getting ready: learning new skills, planning how you will manage your land. Legal requirements: getting registered, dealing with red tape, livestock regulations. Essential equipment: finding the best kit to make light work of chores, health and safety. Growing fruit and veg: improving soil, extending the growing season, planting an orchard. Your first livestock: buying, caring for and rearing animals for meat. Growing feed for livestock: care of grassland, making silage and haylage. Selling your produce: regulations involved, direct sales, farmers' markets. Wildlife-friendly farming: biodiversity, habitat maintenance and creation. Showing your livestock: getting started, preparation, using shows to promote your stock. Liz Shankland runs a successful smallholding that has been home to everything from poultry and pigs to sheep and goats. She breeds pedigree pigs and has twice won the prestigious Tamworth Champion of Champions competition. A journalist and broadcaster by profession, Liz is the author of the Haynes Pig Manual and The Practical Guide to Buying and Running a Smallholding in Wales. She writes for numerous publications about farming and countryside matters, including Country Smallholding magazine.